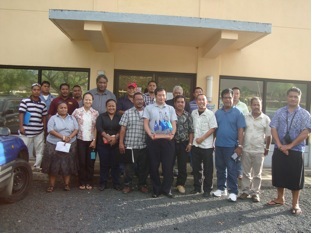 Palikir, Pohnpei -The final National Joint Coordinating Committee (JCC) Meeting, organized by the Office of Environment and Emergency Management (OEEM) in collaboration with the Japan Promotion of Regional Initiative on Solid Waste Management(J-PRISM), was held on December 17, 2015 at FSM OEEM Conference Room in Palikir, Pohnpei. The meeting brought together representatives from the State Environmental Protection Agencies/KIRMA, Departments of Public Works and Transportation and Infrastructure, National Government Department of Transportation, Communication, and Infrastructure, Office of Development Assistance, Pohnpei Waste Management Services, Trash Kings, OEEM, JICA, and Embassy of Japan. Since this was the final meeting and the end of the first phase of the project, participants discussed and exchanged ideas on the remaining activities of the project, and proposed priority actions for Solid Waste Management for the FSM states. During the discussions, it was evident that waste management is still a priority in the FSM and the participants reaffirmed their commitment to ensure the implementation of their State Solid Waste Management Action Plans. The management of waste collection and operations of disposal systems, landfill development, and improved dumpsites are some of the project activities that have progressed under the 5-year J-PRISM Project. J-PRISM Project is funded by the Japan International Cooperative Agency (JICA) and is partnered with the Secretariat of the Pacific Regional Environment Programme (SPREP).